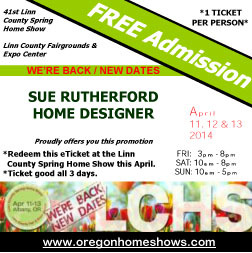 Sue will be at the Linn County Home Show April 11-13. Come listen to one of her seminars or visit with her in booth #226. Friday 6PM "Insulating for Energy Efficiency"
Saturday 12PM "Designing a Big Feel in a Small House"
Sunday 1PM "Passive Solar Design Concepts"
Print this page for free admission and enjoy the show.